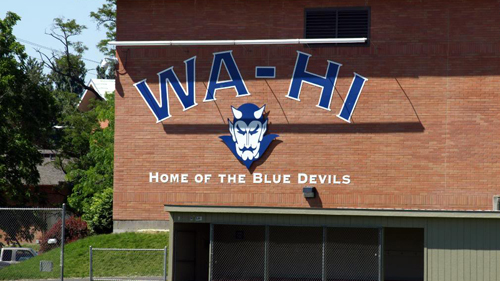 The 77th edition of the longstanding rivalry between Walla Walla High School and Richland High featured new high points for the series. Richland's 64 points is the most scored by either team since they began playing each other in 1945, and the 78 combined points is the highest total. Head coach Mike Neidhold is now 7-2 against the Blue Devils, the best winning percentage of any head coach in Richland history. The series now stands at 29-46-2 in favor of Walla Walla. Oddly enough, it looked at the beginning of the game like the undefeated Bombers might earn their first loss of the season. The first play from scrimmage saw the Bombers take to the air. Paxton Stevens' short pass to Alex Chapman was good, but the Blue Devil defensive back stripped the ball out of Chapman's hands and a linebacker snatched it from the air, returning it to the 1 yard line. After being pounded for a loss on consecutive running plays and an incompletion, the Blue Devils' main offensive weapon, quarterback Mitch Lesmeister, escaped the Bomber D and scored a touchdown. Richland was undaunted, going to Chapman again on the first play after kickoff, and then using Parker McCary to get downfield. At 33 yards out, Stevens spotted Kody Kjarmo betwen two defenders and threw a bullet right into his hands. Kjarmo broke out of an arm tackle, dodged another defender, and sprinted into the endzone to tie the game. The Bomber D had a handle on Walla Walla's passing game and the running backs, but Lesmeister presented a problem, as he continued to slip his way around the defense, eventually finding his way to the endzone around the right end of his line, going up 14-7 with 6:33 left in the quarter. McCary and Ben Stanfield marched the Bombers back down the field, easily gaining consecutive first downs in a rarely seen two back set series, and then receiver Adam Weisenfells grabbed a low pass at the 15, plowed over the safety at the goal line, and evened the score at 14 with two minutes to go. At this point the crowd was prepared for a barrage of points, and they would get it, just not from both teams. Lesmeister's two runs would be the last points for Walla Walla. Two plays into Walla Walla's next drive Victor Strasser got some air to pick off a pass and rumbled 40 yards to the endzone. Although the corner pylon was knocked over, he was ruled down at the one, and McCary and lead blocker Stanfield both went untouched into the endzone to get the lead for good. The second quarter saw a new defensive attitude from the Bombers, apparently offended by Lesmeiters' insistence on making plays. The rest of the game was mostly three and outs with very few bright spots. Their offense would total only 109 yards for the game. Richland's next offensive series got down the field with big passing plays to Josh Mendoza, Weisenfells—who showed willpower and toughness after the catch on this drive and for the entire game—and Gaven Brasker, who was eventually tossed out of bounds at the 1 after a 17 yard gain. McCary again followed Stanfield through a dominant line into the endzone for his second touchdown. The following extra point kick was abandoned after a low snap, but holder Ryan Kriskovich was able to scramble right and get the ball off just as he was hit by the defense. Braden Powell was open in the back corner for two more points. 29-14. After another defensive stop and the running backs carrying the ball down the field, Stevens found Weisenfells open at the 25. Immediately juking two defenders and getting a great block from Mendoza, he went down the sideline, cut inside to dodge a defender, cut back outside to dodge a couple more at the 5, and scored the second of his four touchdowns to make it 36-14 with 1:46 left in the half. After five plays of punishment from the Richland defense, the Blue Devils punted to Brasker, who returned it 15 yards to the 35. McCary got the ball on the next play and went 65 yards for his third score. With 9:44 left in the third quarter, the game was already a blowout at 43-14. Walla Walla managed to hold the Bombers on fourth down at their own 20 yard line, and seemed eager to salvage some dignity, but after a few successful plays Weisenfells showed his face again, reading Lesmeister's intention and snatching a pass at the 40, taking it down the visitor's sideline, pausing only to let Strasser level the quarterback to clear the last 10 yards into the endzone. Weisenfells' kick was good, making it 50-14 with 4:15 left in the third quarter. Two minutes later Stevens found Weisenfells again, this time on a slant through the middle, where he burned his defender and spun the safety around for a 77 yard touchdown. 57-14. Up 43 points in the fourth quarter, Richland brought in the reserves. Quarterback Cade Jensen completed passes to Kjarmo and Kriskovich, who also had a near interception and a batted pass on defense, and Tyler Fishback helped run down the clock by running the ball. Fishback eventually found his way into the endzone from ten yards out to close the scoring at 64-14 with four minutes left. Although this was the first game in which Chapman and Stanfield didn't score, the Bombers showed their offensive diversity and their ability to use multiple weapons to score points. Defensively, Kyle Kirby and Brigham Whitby made big plays and maintained a bruising level of intensity throughout the game, and both lines were simply dominant throughout. Next week's conference championship game against the undefeated Chiawana Riverhawks will test that dominance, and it should be a playoff atmosphere at Edgar Brown stadium. Get there early, kickoff at 7PM. Walla Walla Union Bulletin preview of the Richland Walla Walla game in the October 13, 2016 edition written by Hector del Castillo. Tri-City Herald article written by Dustin Brennan in the October 14, 2016 edition. Walla Walla Union Bulletin game recap of the Richland Walla Walla game in the October 16, 2016 edition written by Hector del Castillo. Tri-City Herald MCC Football Roundup from the October 16, 2016 edition. Tri-City Herald article on Adam Weissenfels after his 4 touchdown, 8 extra point performance versus Walla Walla from the Thursday, October 20, 2016 edition. Tri-City Herald state football poll article from the Thursday, October 20, 2016 edition.